This two-day regional workshop aims to strengthen participants’ capacity and understanding of ‘development finance’ policies with a specific focus on climate finance and its recent developments. 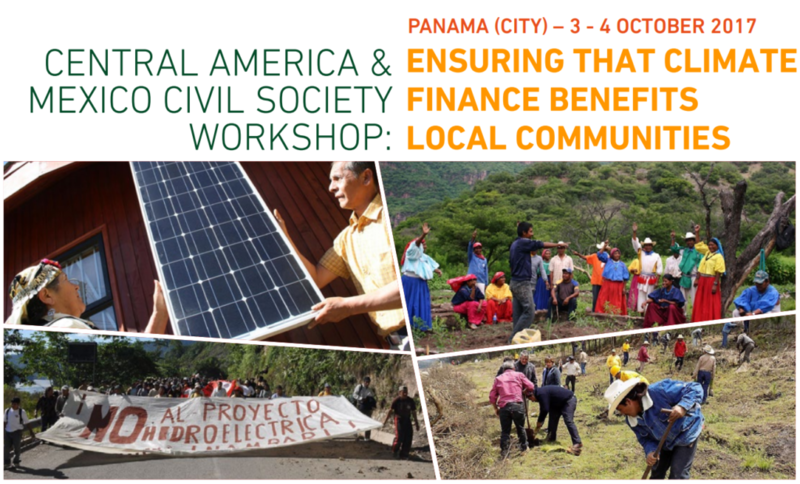 Participants will also be invited to share their experiences with climate finance projects and to reflect on the elements needed to ensure that projects benefit local communities. Share and discuss current climate finance policies at the global, regional and national levels; elements and tools available to ensure that climate finance is effective and benefits communities; latest progress in negotiations on the subject; latest relevant developments in Central America and Mexico, including through multi stakeholders panel. Share experiences on the impacts of climate change mitigation projects implemented in the region with international funds, with special emphasis on those promoted by the Clean Development Mechanism and supported by funds from the Green Climate Fund. Background: With the signing and ratification of the Paris Agreement, Latin American countries have committed to moving towards a low carbon and climate resilient sustainable development. At the same time, developed countries, in recognition of past responsibilities and the needs of the poorest countries, have committed themselves to increasing their contributions to the financing of climate change mitigation and adaptation activities. These funds, channeled through national, regional and international financial institutions, have played an important role in financing the way to a green economy. However, experience to date has shown that some projects funded by international climate funds or registered under the Clean Development Mechanism, far from benefiting local communities, have led to serious environmental and social conflicts, sometimes culminating in human rights violations. These conflicts are largely due to the inadequate planning of such projects, stemming from poor processes of consultation and free, prior, and informed consent that prevent meeting the needs of communities and incorporating local knowledge in the design of projects. While the objective of climate finance is to promote a paradigm shift towards low-emission and climate-resilient development, funds often support non-innovative or obsolete technologies, which are not effective in the fight against climate change and delay the implementation of urgently needed solutions. After 2020, the main climate finance tools could be the Green Climate Fund (GCF), established during the United Nations Conference on Climate Change in 2010 in Cancún, and the Sustainable Development Mechanism, created by the recently approved Paris Agreement.